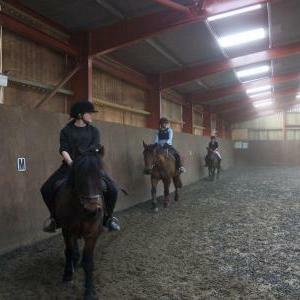 A Group Horse Riding Lesson is taught in our Indoor Arena, you'll be practicing different exercises, to improve your riding and gain great confidence and horsemanship.. A Group will typically have 6 riders to 1 instructor (with a maximum of 8). The minimum requirements for the majority of Group Lessons is proficient Walk and Trot with some Canter experience, sometimes we offer Beginners Groups, this is where all riders are total beginners, and each rider and horse will have a handler, until all riders in the group reach a safe standard where they can control the horse themself. Group Lessons are really fun, and a great way to continue your riding experience after Private Lessons. A Group Horse Riding Lesson is taught by an experienced instructor in our Floodlit 40x20 Indoor Arena. Most groups are children only, or adult only. There will typically be 6 riders in a group (with a maximum of 8), and each group is usually of a similair level of development and ability. We like to keep the Group Lessons fun and engaging, you'll practice many different exercises with the aim of improving your confidence, and riding ability. Most Group Lessons of adequate ability will feature jumping practice, but we don't guarantee it every lesson. The great thing about Group Lessons, is taking part in an activity with other likeminded individuals, it's a great way of meeting new people, and making friends. We sometimes run Beginners Groups, this is where all riders aretotal beginners, and each rider and horse will have a handler, until all riders in the group reach a safe standard where they can control the horse themself. Group Lessons are really fun, and a great way to continue your riding experience after Private Lessons. All group sessions are 60 minutes in duration, most people find these both satisifying and challenging, for that reason, we don't offer longer. We offer significant discounts on all our riding!. Group Riding Lessons are discounted to clients who wish to maintain a weekly regular booking. This is called Regular Riders Club, to qualify you must maintain a weekly continuous booking through the year, paid monthly in advance (4 or 5 weeks depending on the month). This also has benefits, once you maintain a Primary Regular Riders Club booking, all additional riding is heavily discounted, our Club+ discount rate applies to any further riding you do during that month. There is a Different Price for 5 week calendar months.